It was all Glitch all of the time last week – 5,743 words of revisions and a completed third draft. 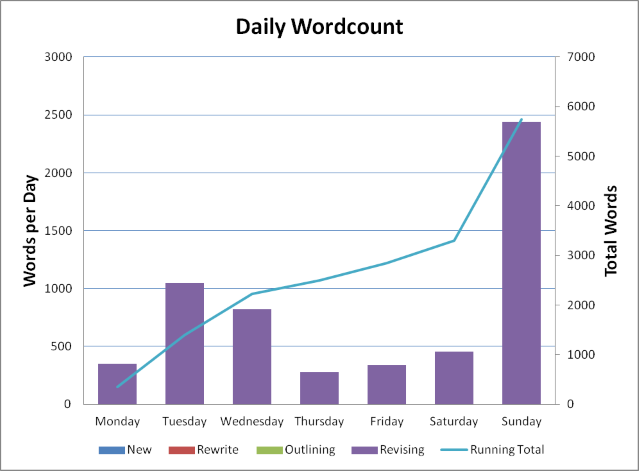 Sunday’s 2,441 words was also my third most productive writing day – a direct side-effect of the need to finish the draft before sending off for editing. Next up, finalising the first draft of Leah – it’s a bit of a mess at the moment, all sorts of random chunks that need to be deleted or expanded or moved around. That should keep me busy for a couple of days.